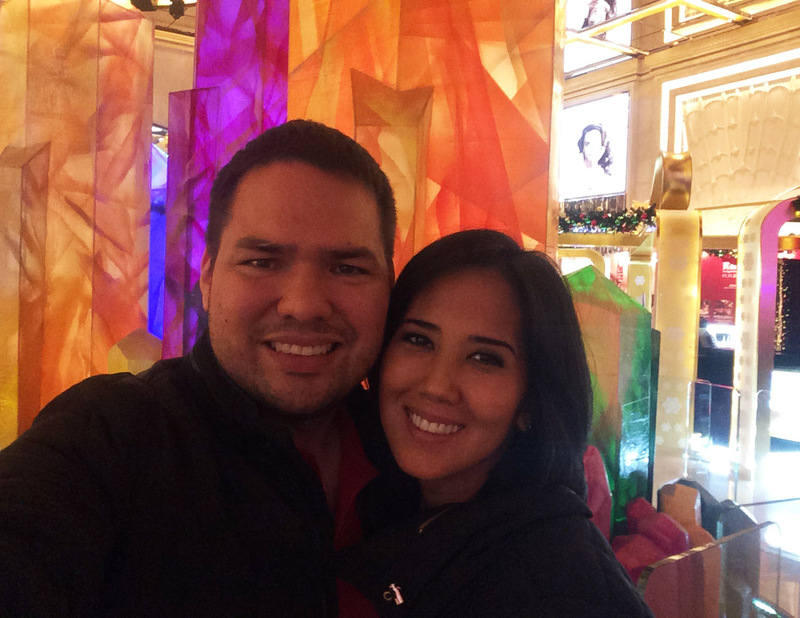 We had a great time in Vegas few years back, so we decided to make a trip to Macau, the Las Vegas of Asia. Legend has it that it is where you see grown men cry. 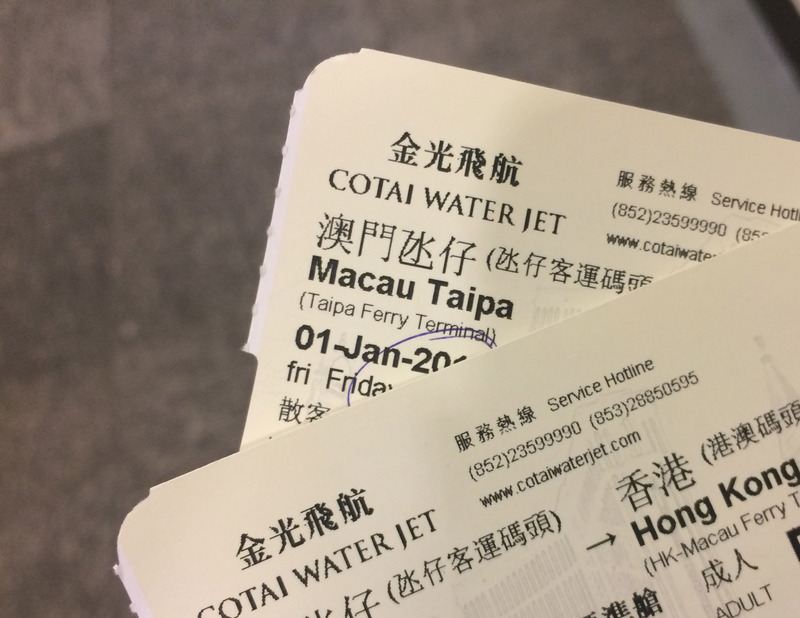 Since we were still in Guangzhou, we decided to travel to Macau by land, which was also the cheapest and fastest way to get there. We booked in advance for the 7:30 am bus that leaves from the Garden Hotel. It was an easy 10 minute walk from our hotel. 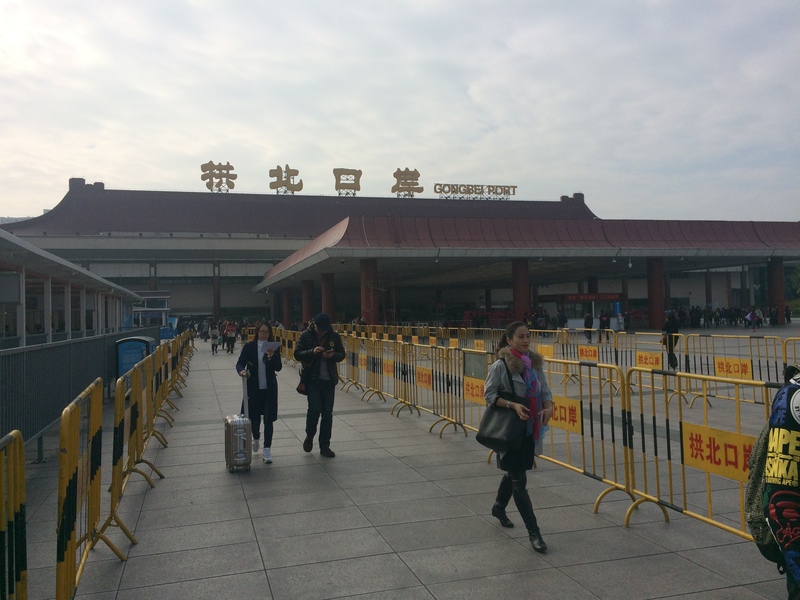 One way tickets were 65 yuan per person and you get dropped off at the Gongbei Port in Zhuhai. That’s my baby, still smiling even though he was forced to wake up at 6 am. 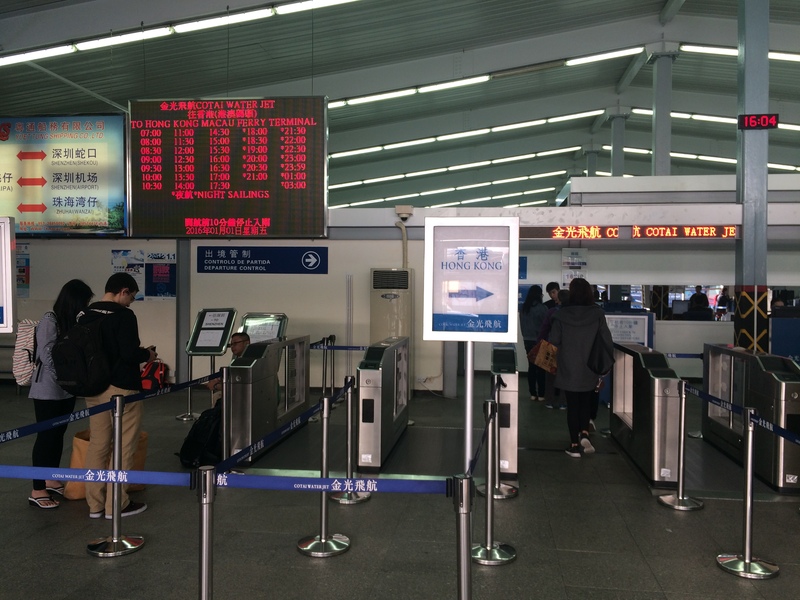 Everything went well that morning: the bus left at exactly 7:30 am; the bus seats were very comfortable; and and there was no traffic at all so as they estimated, we were at Zhuhai in 2 hours. 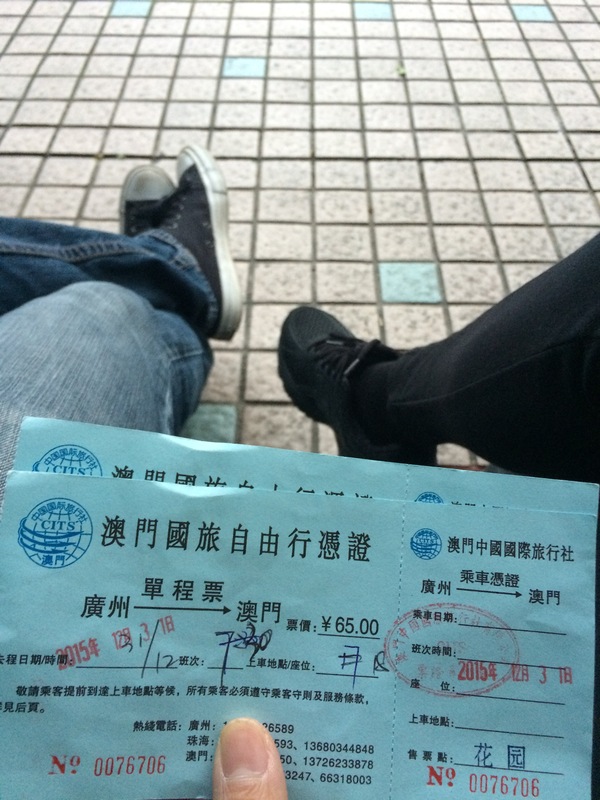 We got off at the Gongbei Port and walked to Immigration to have our passports stamped for our China exit. The Gongbei Port at Zhuhai. This is one of the ports of entry by land between China and Macao. The other one is the Hengqin Port. 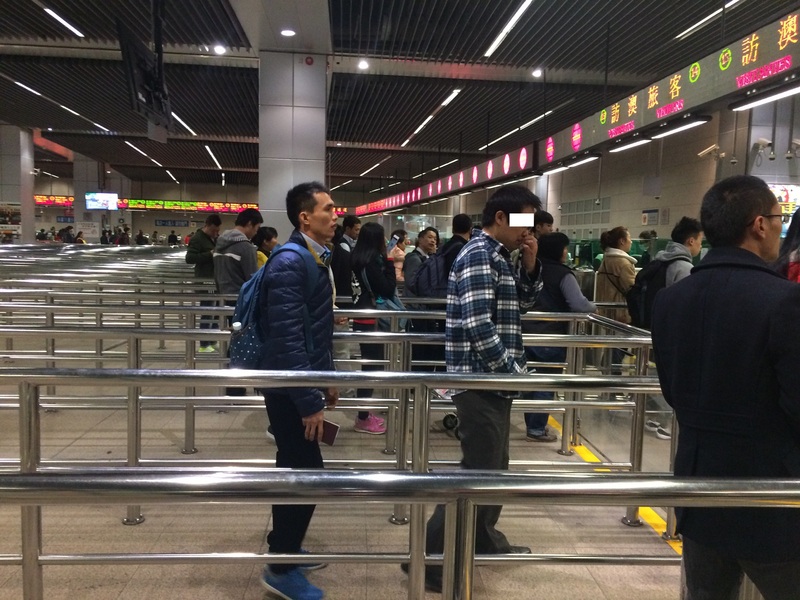 Surprisingly, the line in Immigration was not long considering that it was day 1 of the 3-day holiday. 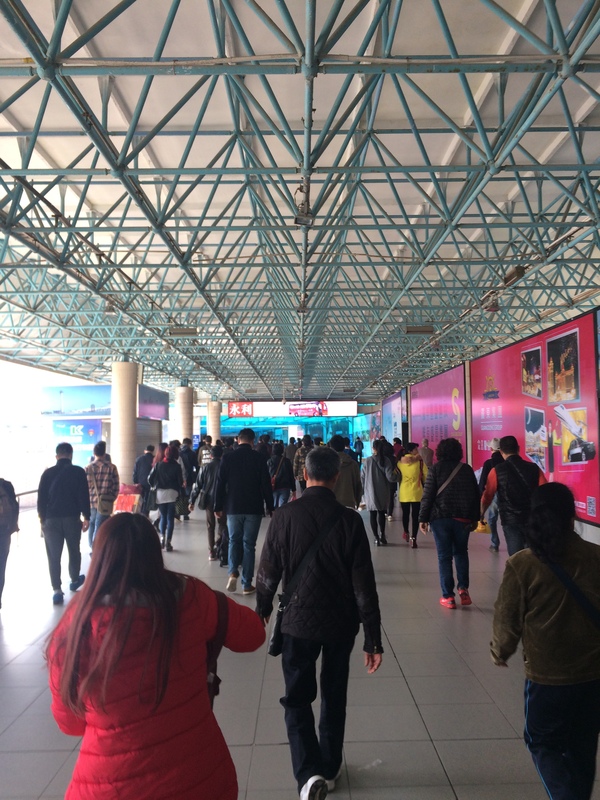 In less than 10 minutes, we were walking along with the crowd, hoping that we were following the right crowd towards the Macau entry point. It was turning out to be an amazing morning! 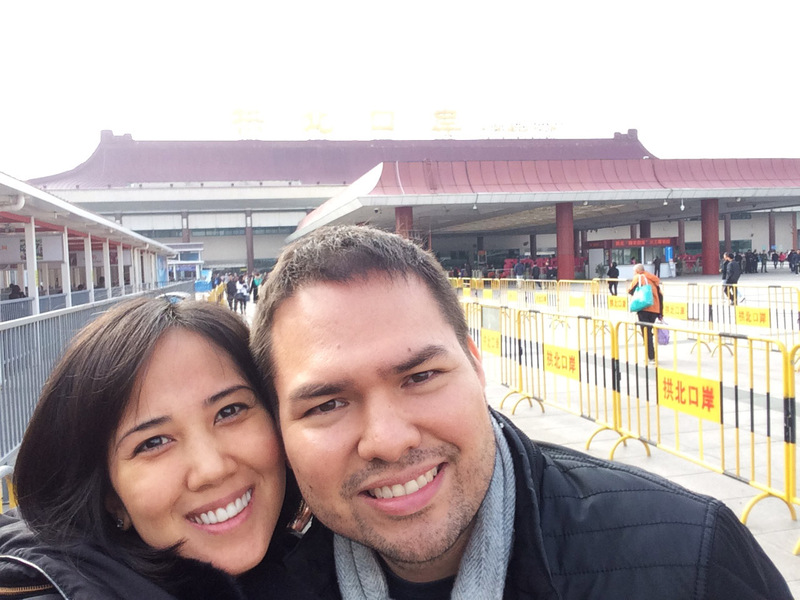 We get to the Macau Immigration and finished in less than 5 minutes. The guy in the checkered long sleeves is very engrossed with what he is doing. I took 4 shots, he was doing the same thing in all of them. He left me no choice. 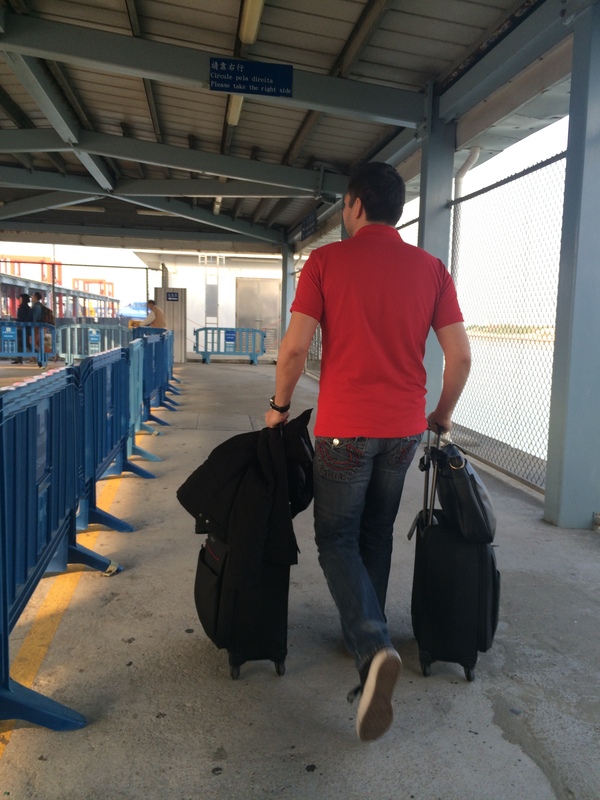 Once outside the port, we set out to look for the buses. We had to go to the Terminal Maritimo to pick up our “hop on hop off bus tickets” for tomorrow. 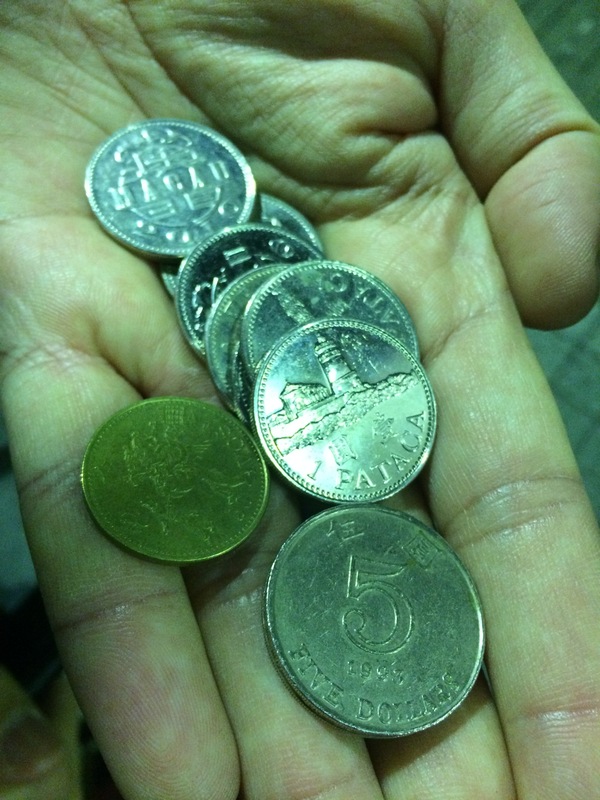 When we got to the bus station, we found out that the bus only takes coins, and at that moment we had nada. Marco left to look for change, while I stood in line eating my sliced apple. One of the bus drivers, an old man, came up to me and sticks his hand out asking for a slice. I smile and hand him one. 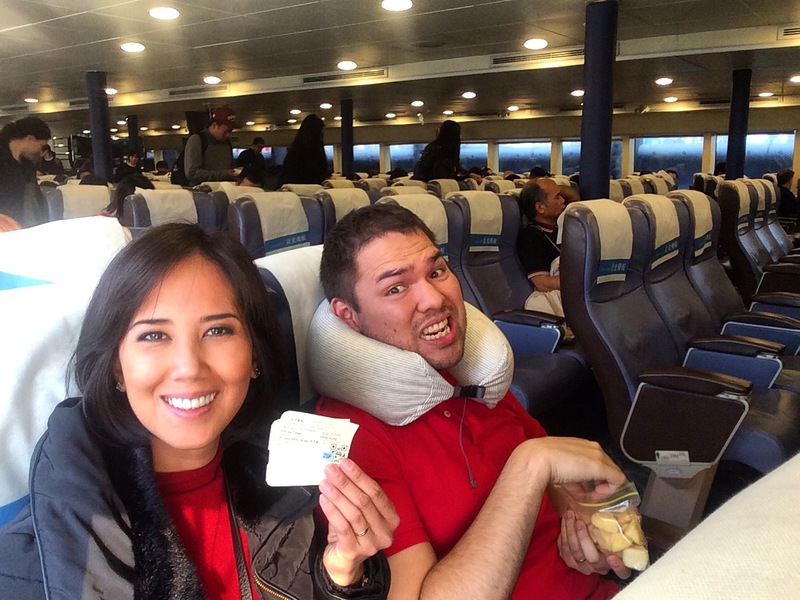 The Chinese man says “Thank you,” the Filipina girl says “Bu keqi” (you are welcome). Interesting.. Husband comes back with coins, lots of them. And coffee breath. That’s why it took him a while! 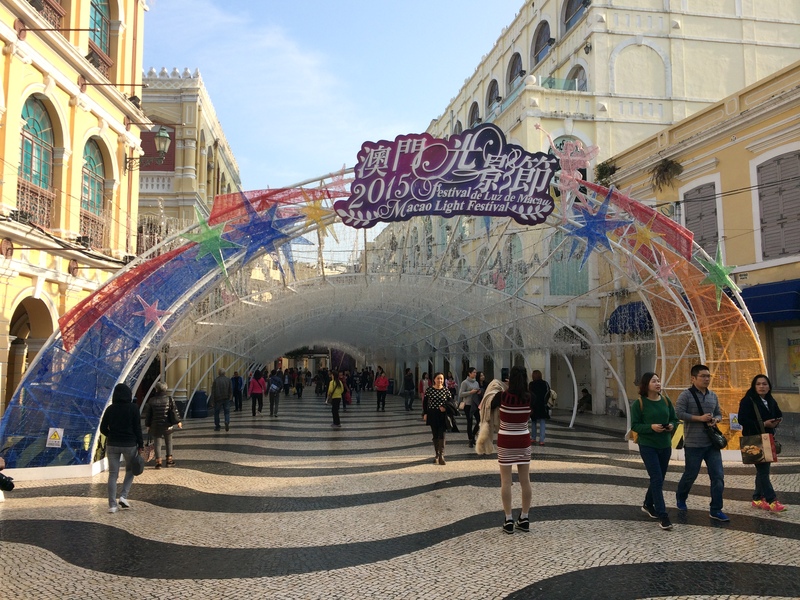 The currency in Macau is Macanese Patacas or MOP. 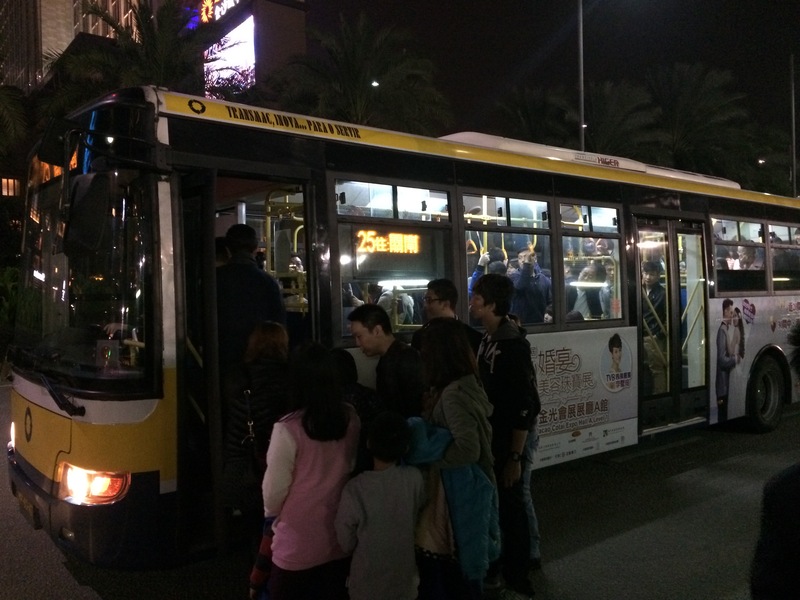 Commuting in Macau via the bus. 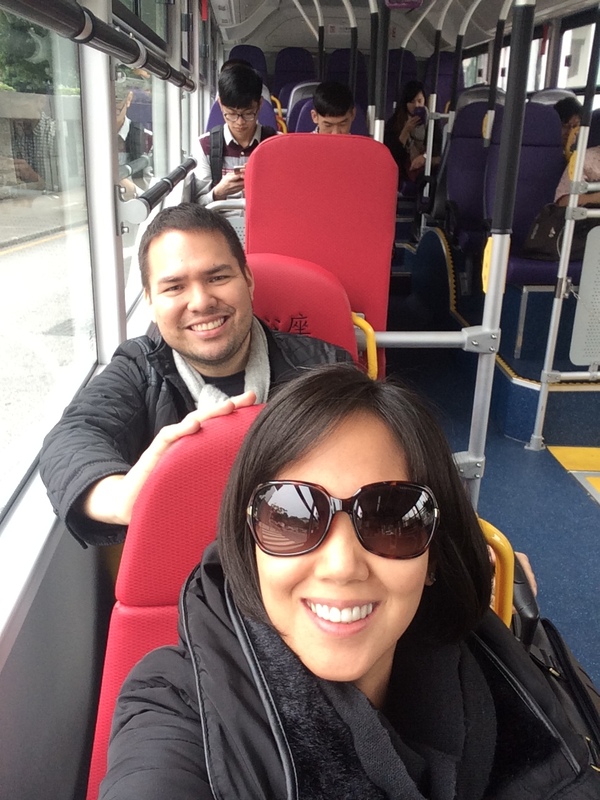 After our errand, we took the bus to Senado Square for our air bnb meet up. 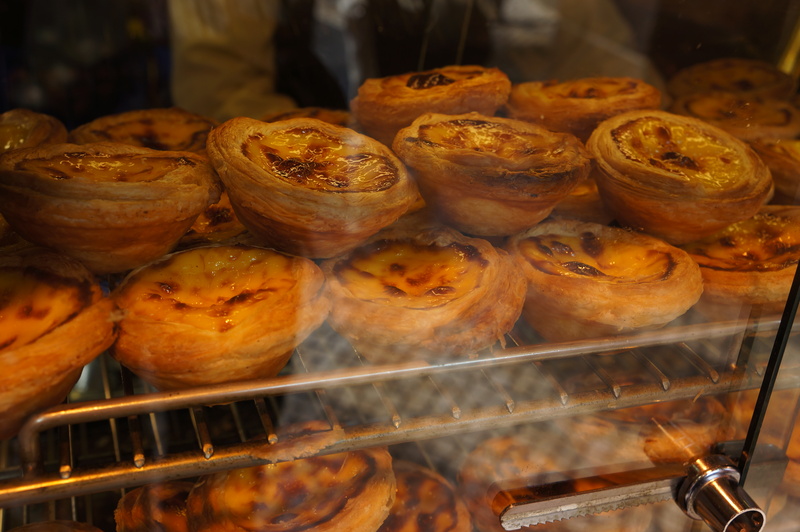 While waiting, we saw a bunch of people lining up to buy Portuguese egg tarts. OF COURSE, we got in line too and Marco tried one. He said it tasted reallllllyyyyy good! At 12 noon, the owner of the apartment arrived at Senado Square and we headed to his place. 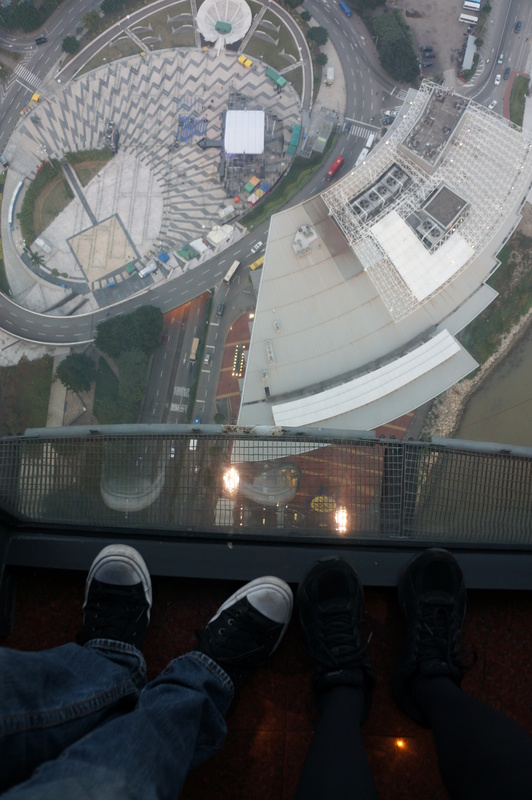 Marco and I napped and by 4:30 pm, we started making our way towards the Macau Tower. 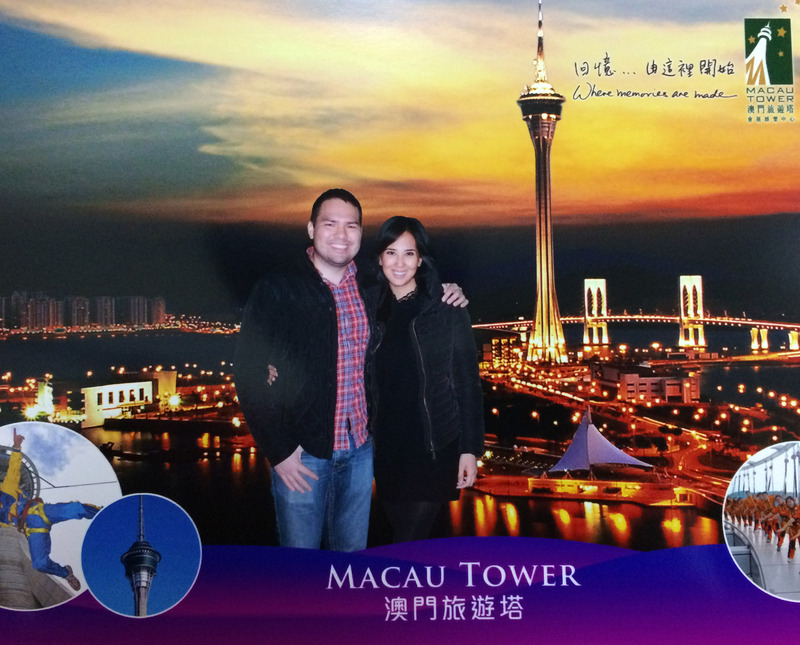 It was a scenic walk towards the Macau Tower. 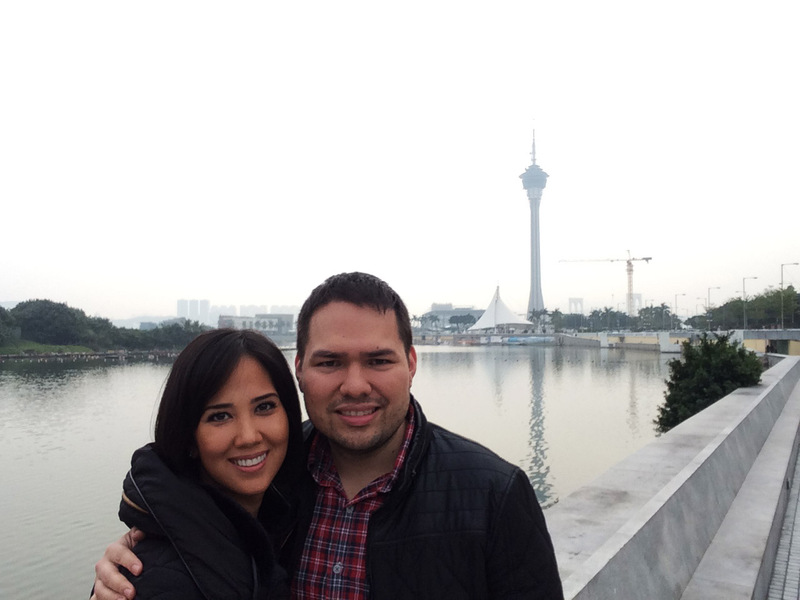 We walked along the Nam Van Lake which is a man made lake, 1 of the 2 they have in Macau. We had a good view of the tower, the Wynn hotel and the Grand Lisboa. 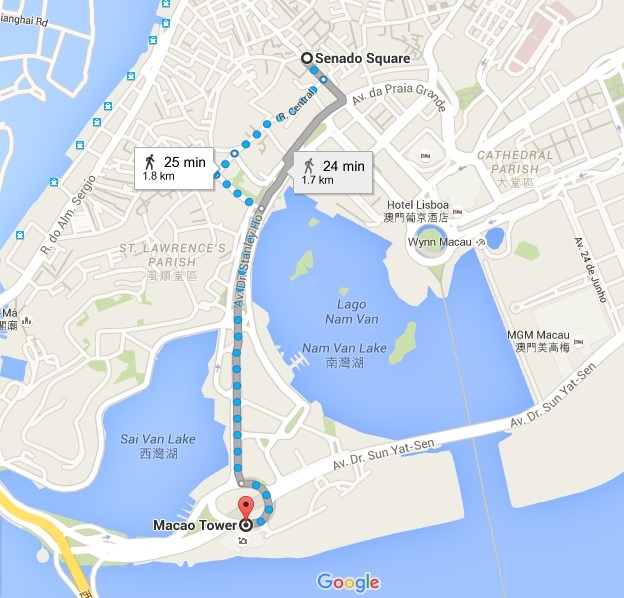 The route that we walked from the apartment to the Macau Tower. 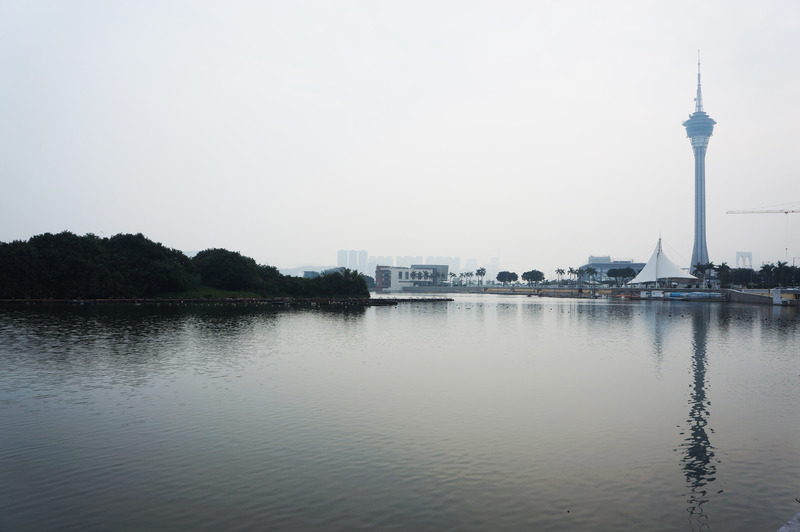 The Nam Van Lake and the Macau Tower. 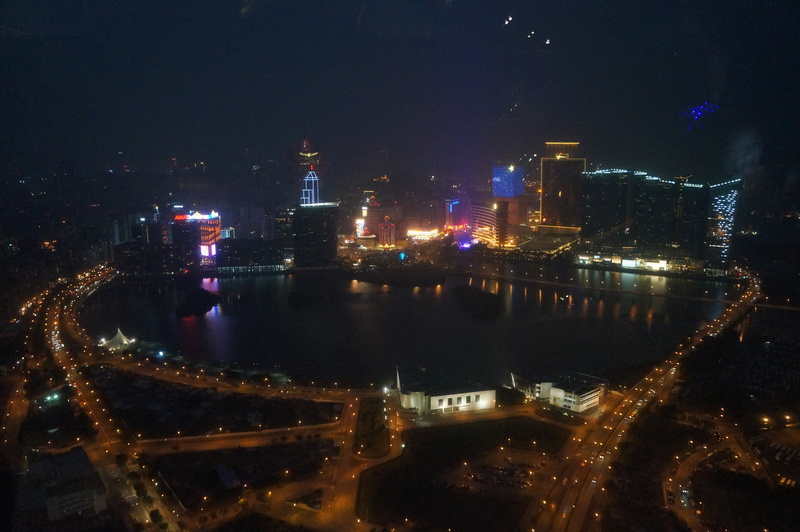 Wubys, the Nam Van Lake, and the Macau Tower. 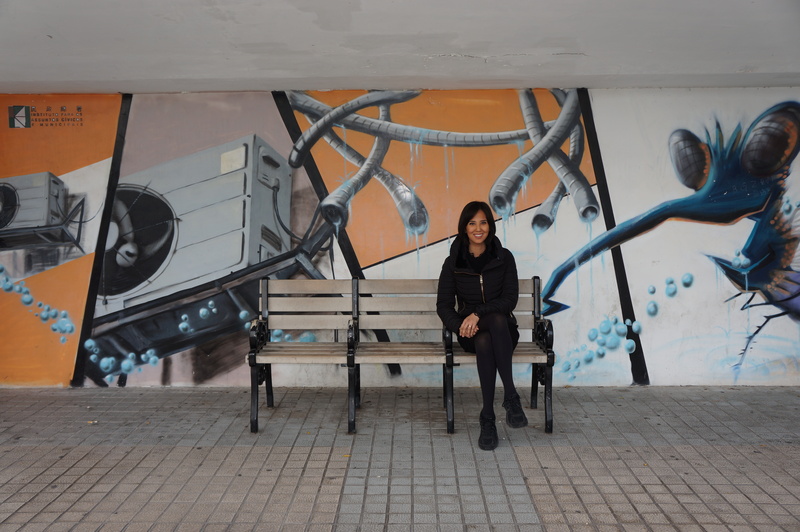 They had some benches and street art on the walkway alongside Nam Van Lake. 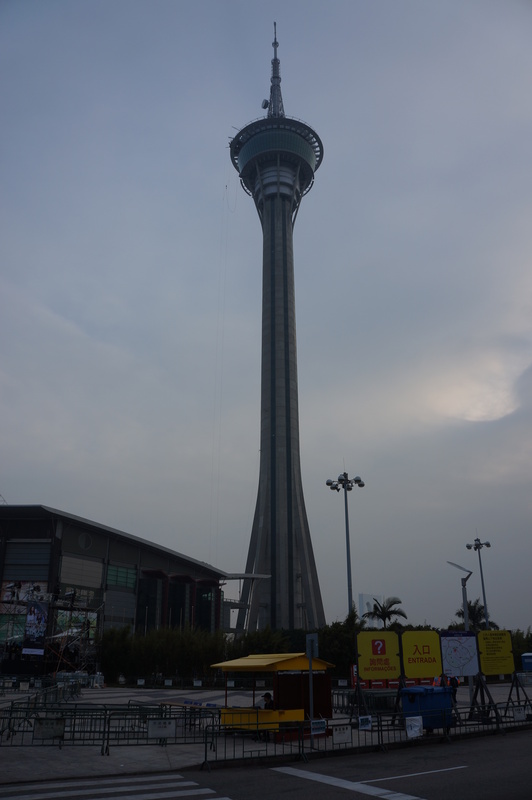 The Macau Tower was built in 2001 and is 338 meters from ground level to the top. 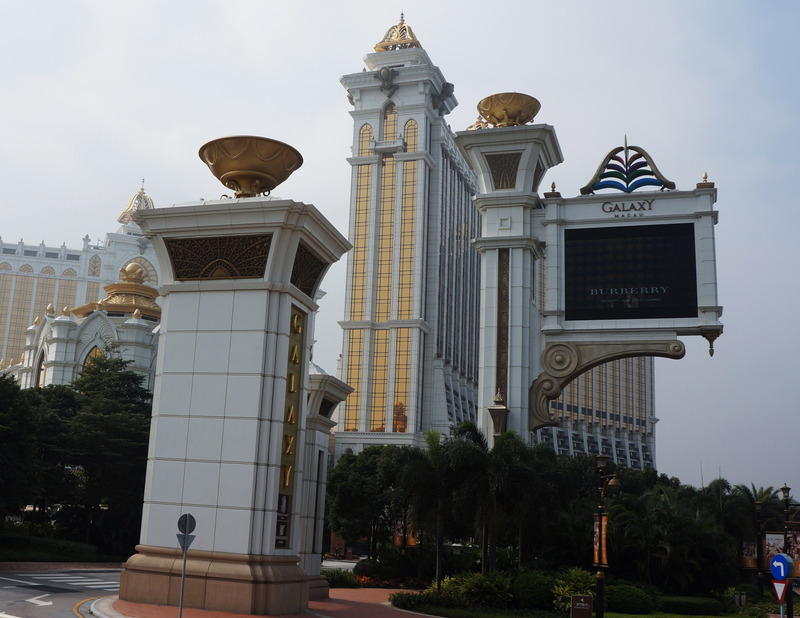 It has an observation deck with a 360 degree view of the Macau Peninsula, Taipa, Coloane, and China. 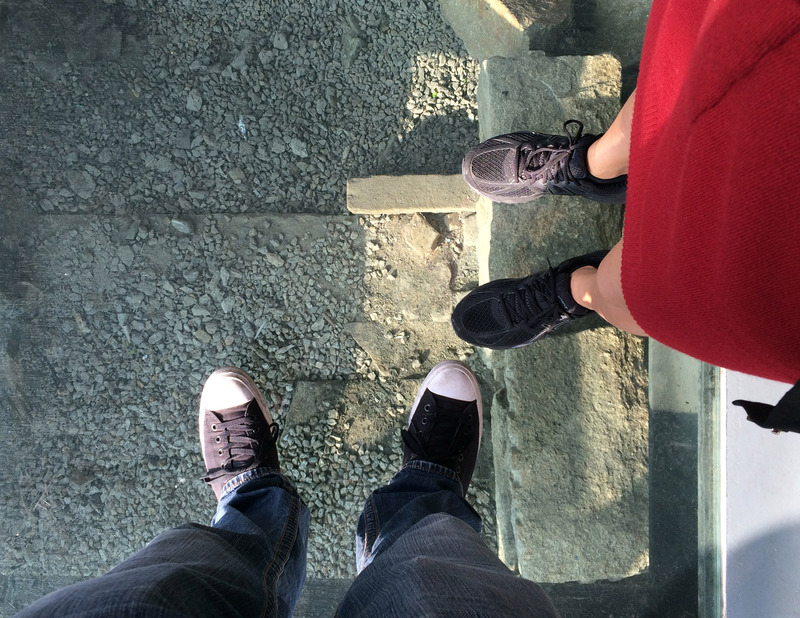 Wubys in the Macau Tower, 233 meters above ground level. 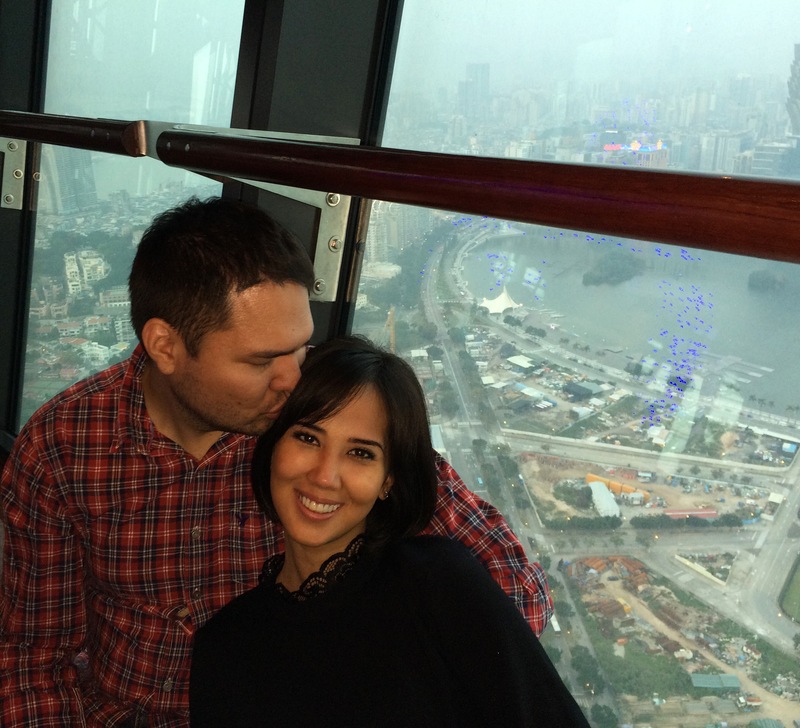 The view from the Macau Tower. And of course, we did this touristy thing. 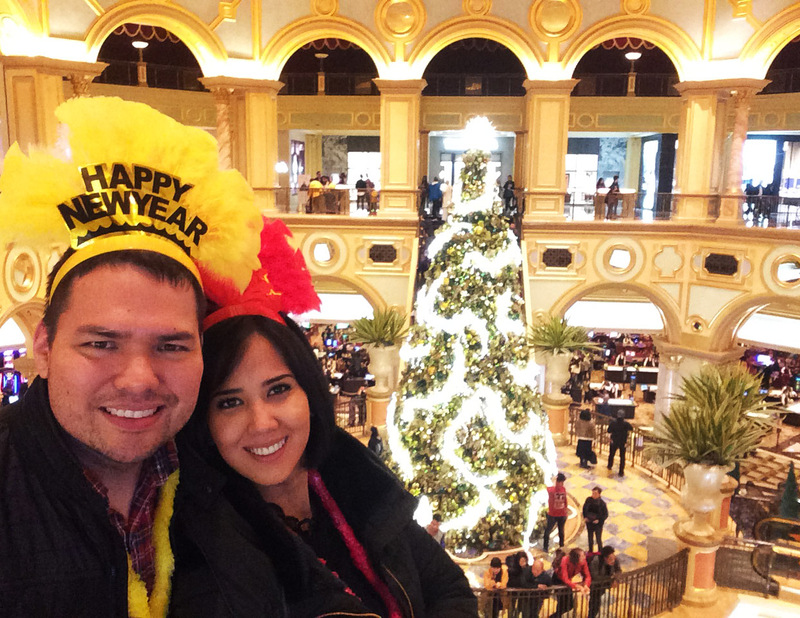 From the tower, we took a taxi to The Venetian Hotel for our New Year’s Eve buffet dinner. Marco wanted to take the bus which was going to stop directly in front of the Venetian, but would take us about 16 stops to get there. 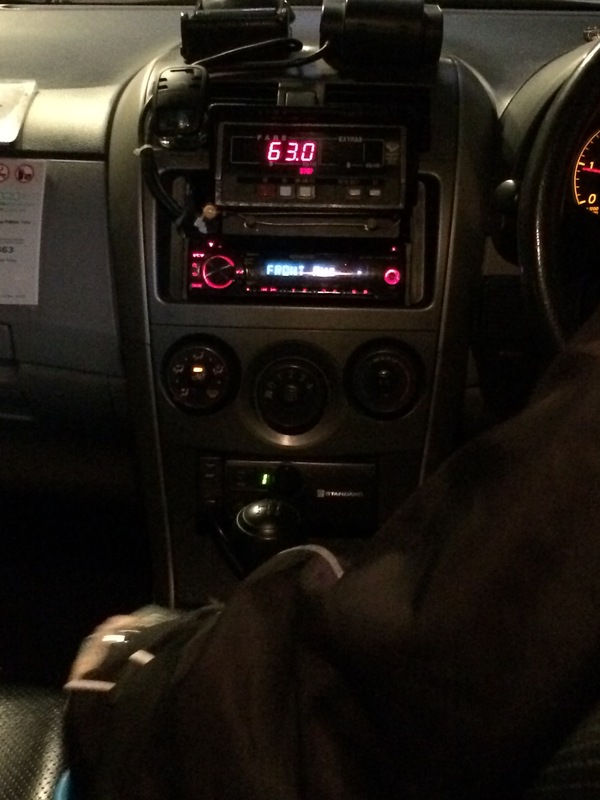 I was not up for this and so I insisted that we just grab a taxi because it wasn’t that far anyway, 5.3 km. In my head I was thinking, what’s 30 mop right. We’ll, we’ll, we’ll. That meter was damnnnnn cray cray! Crossing the Sai Van Bridge was a breeze. Once we got off the bridge, that’s where the traffic started, and when the meter started sprinting for its dear life. I betcha, we were less than 1.5 km away cause we could see the Venetian lights shining brightly. We weren’t stuck for so long but when we got to the hotel, our meter read 63 MOP. ARE YOU FREAKIN’ KIDDING ME? If we had taken the bus we would have probably spent less than 10 MOP for both of us. I couldn’t blame this one on Marco because I was the one who insisted we take the cab. Darn it! 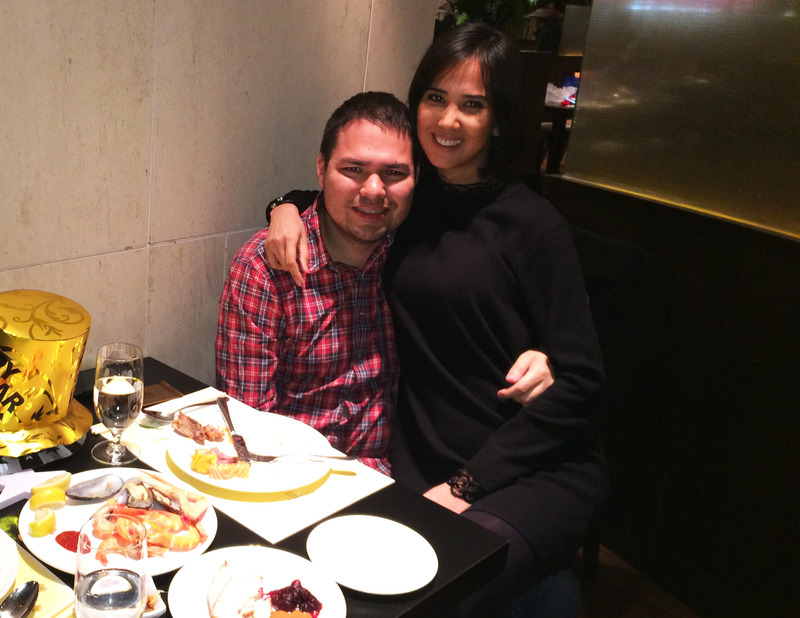 We went to the Bambu restaurant in the Venetian hotel for our 7 – 9 pm buffet dinner. The spread was amazing! And they had these cute New Year’s Eve paraphernalia per table. We sat there for 2 hours stuffing our faces and talking about our 2015. The lessons we learned, the funny moments, and the stupid things that we did – which were actually the highlights of our year. 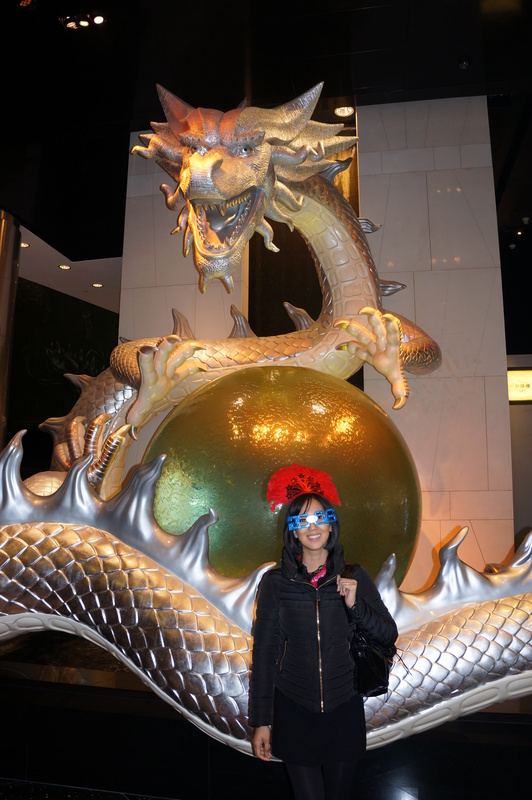 Dinner at the Bambu restaurant in the Venetian Hotel. After dinner, we walked around and checked out the shoppes area and the canal where the gondola passes through. Who wore the hat better? Marco – 1. Kyla – 0. 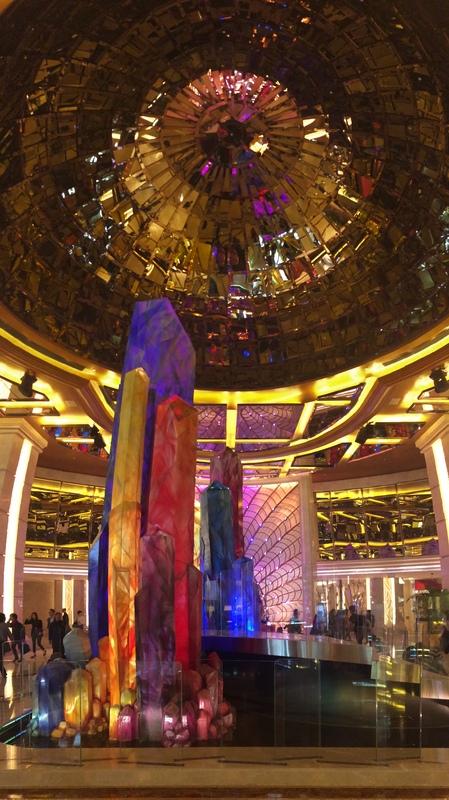 Wubys at the Venetian Hotel, Macau. 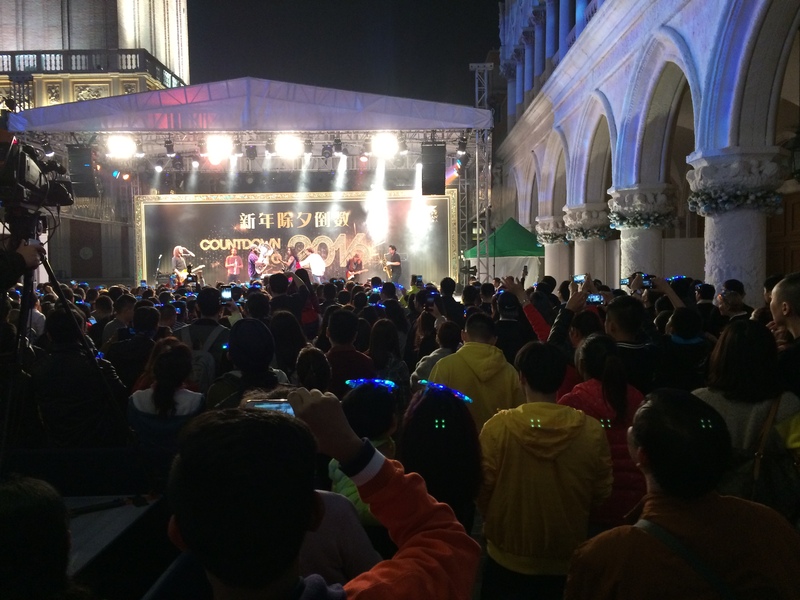 The New Year’s Eve concert outside the Venetian. We partied for a bit, then walked to the City of Dreams. In the City of Dreams. We had been walking for a while and we decided that our knees and feet needed to get some rest. 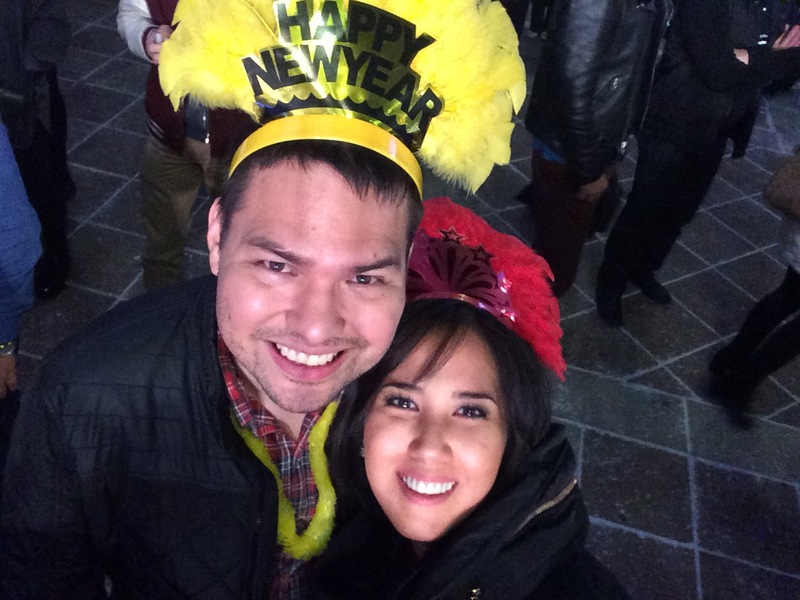 It was only 11 pm, we had an hour before 2016, an hour that we could sit our old butts down. 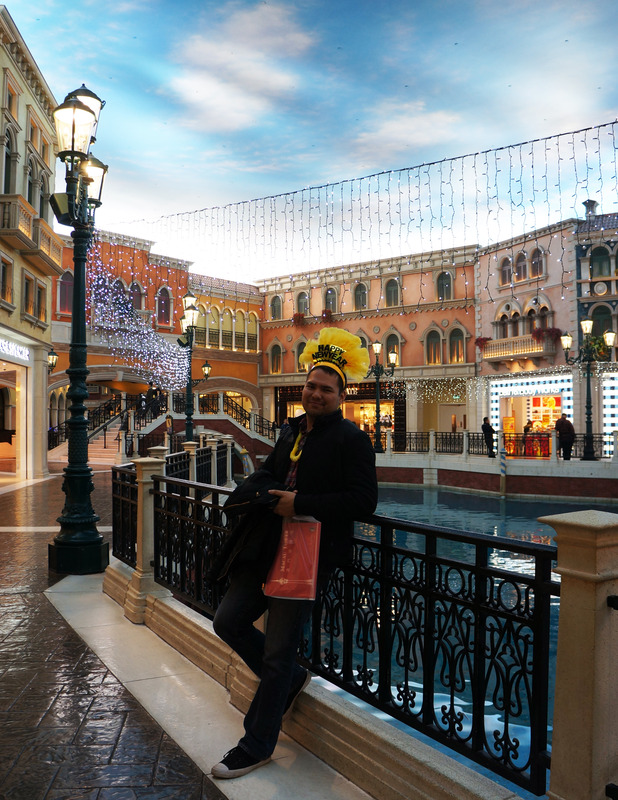 We sat outside the City of Dreams, facing the Venetian Hotel. We could hear the concert from our spot, it was perfect. Despite our original plan of partying like it was 2001, what we ended up doing was far better, or so we thought anyway. At 11:40 pm, we decided that it was the golden hour. If we didn’t skidaddle over to the Venetian, there would be no chance of us getting a good spot. 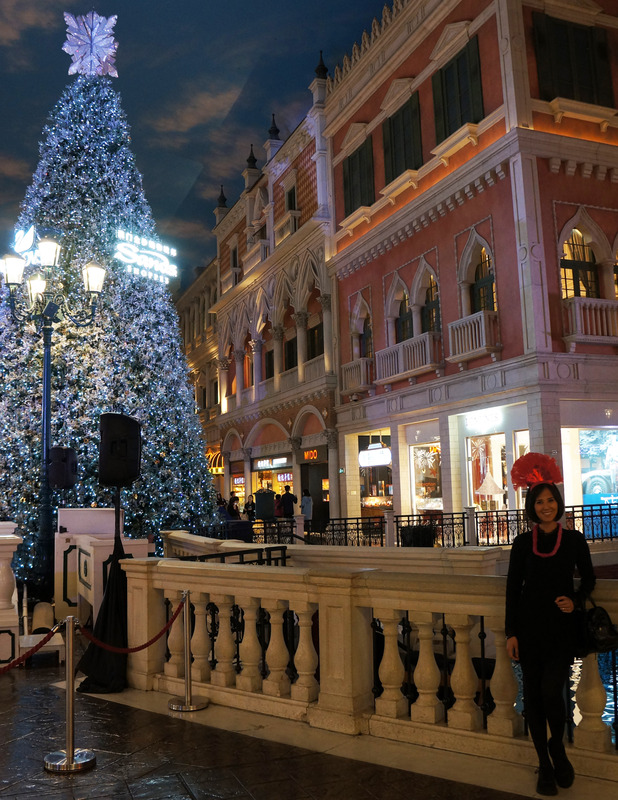 We got there right on time, and we were able to squeeze our way into a perfect spot facing the Venetian Hotel. They did a minute by minute countdown starting at 10 minutes. 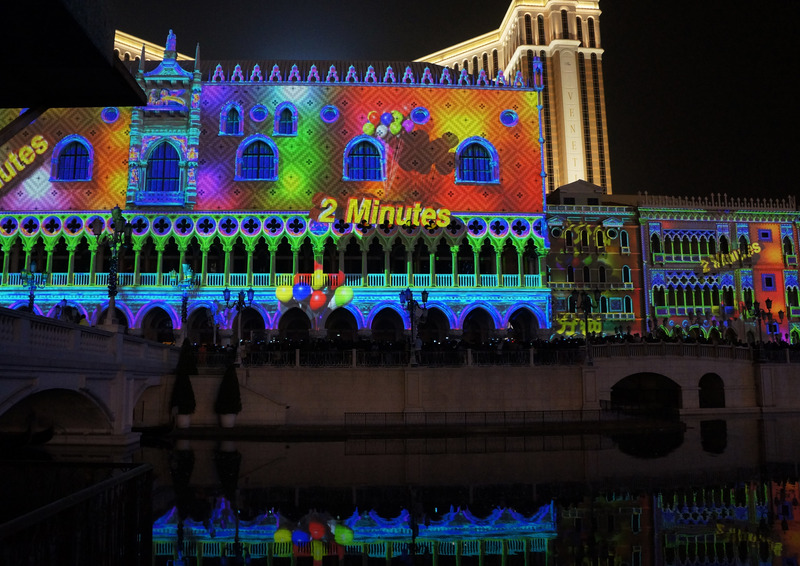 Along with the rest of the crowd in Cotai Strip, we screamed our heads off when “2 minutes” flashed on the wall. And before we knew it, we were counting down in seconds. 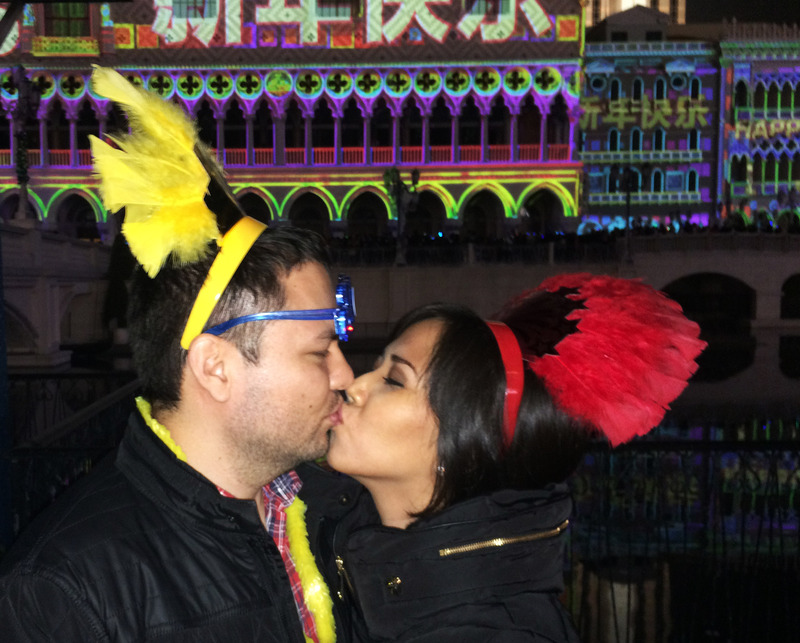 Happy New Year from the Wubys! We took some photos and hurried towards the nearest bus station, just anxious to get home from a very long day. Unfortunately, everyone else in the strip had the same idea. We walked over to Studio City to get a taxi to find a very long line. We walk towards the hotel lobby and along the way, one of the support staff outside Studio City says “Happy New Year” to us, and we recognized the Filipino accent. We asked him if there was a faster way to get a taxi, he said that we would really need to line up. He suggested that we take the bus, so we told him that we had no coins that’s why we couldn’t take it. Marco asked if there was a place inside where we could change some bills for coins. — smiles at us and says, “let me give you coins.” Let me GIVE you, not- let me change your bills to coins. I find that level of kindness very touching. Here is a man, away from his country and maybe his family too, working on New Year’s Eve outside the hotel where it was chilly, and offers to share his coins with us, the strangers that he will probably never see ever again. 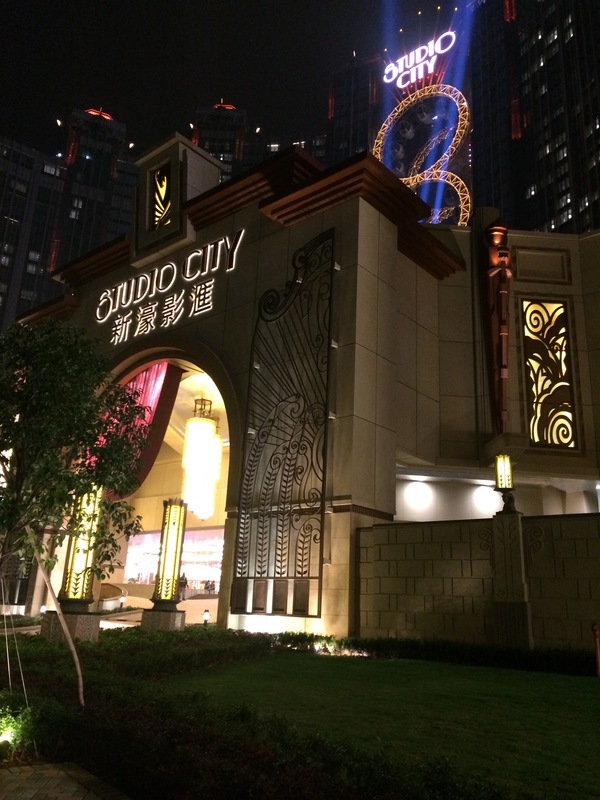 If you see Robin when you visit the Studio City in Macau tell him we said HI, take a selfie with him and tag us! We thanked him profusely and took the bus right outside Studio City. It was a blessing too because we were the 1st people on it and we got to sit down. We got back to the apartment at 2 am, and zzzzzznored away. 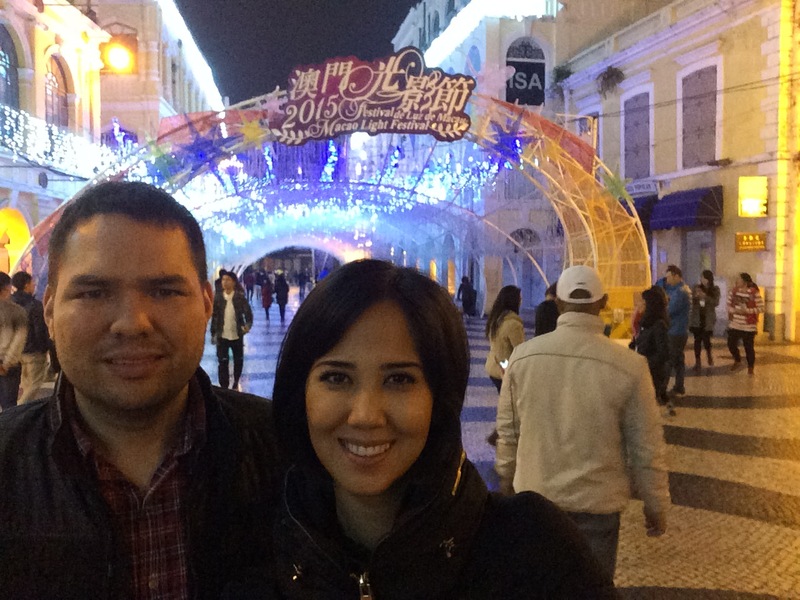 We woke up bright and early, January 1, and started our day exploring Senado Square. 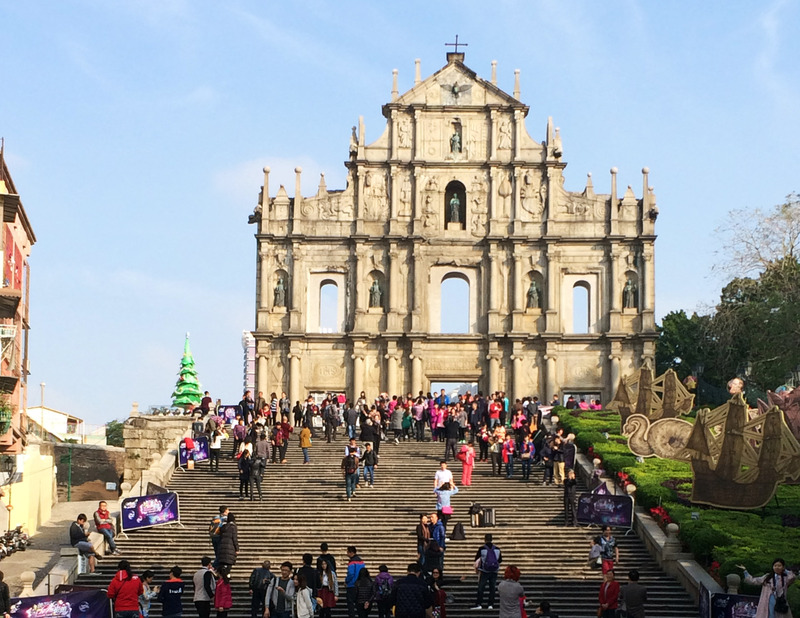 The Senado Square or Largo do Senado is a paved town square in Macau, and in 2005 it was inscribed on UNESCO’s World Heritage List as it forms part of the Historic Centre of Macau. 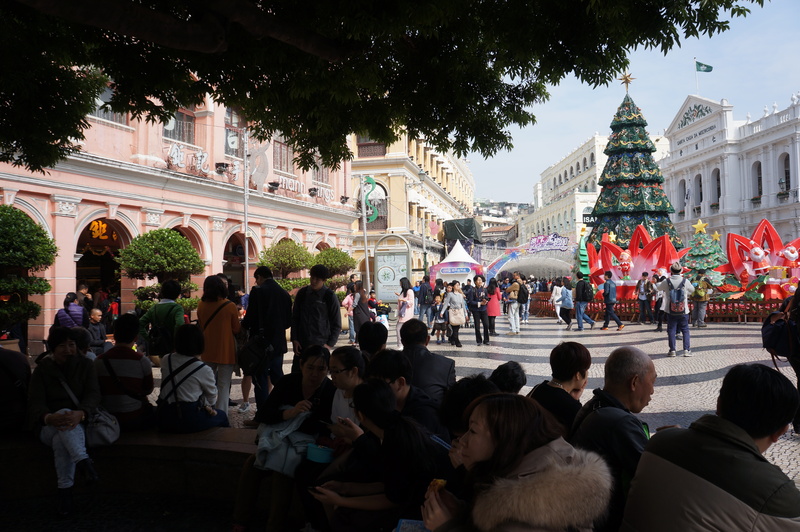 The public square covers an area of 3,700 square meters, this is one of the four largest squares in Macau; the others being Praça do Centro Cultural, Praça do Lago Sai Van and Praça do Tap Seac. The square has been there since the Ming Dynasty (1368-1644) and during the era of Portuguese control, this is where the local authorities used to review the troops on their inaugurations. 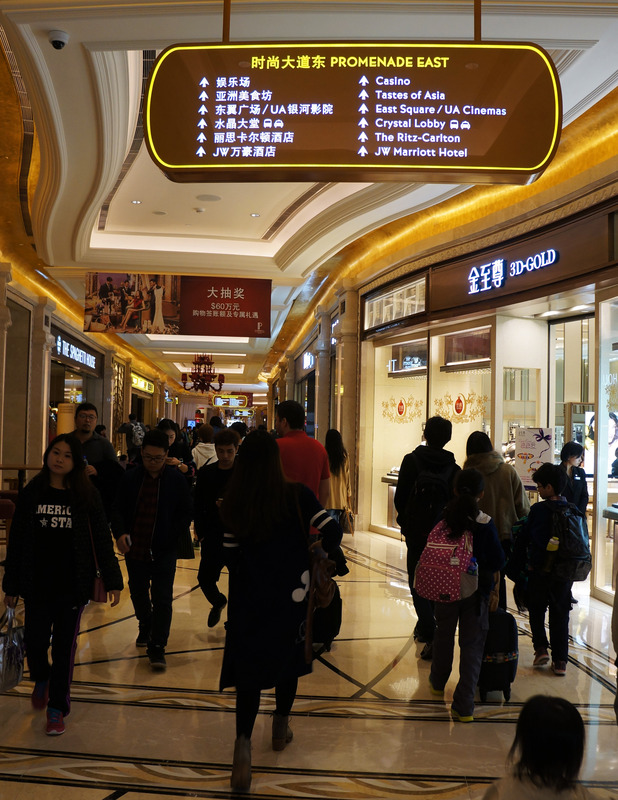 Now, there are shopping centers and traditional Chinese restaurants around it. 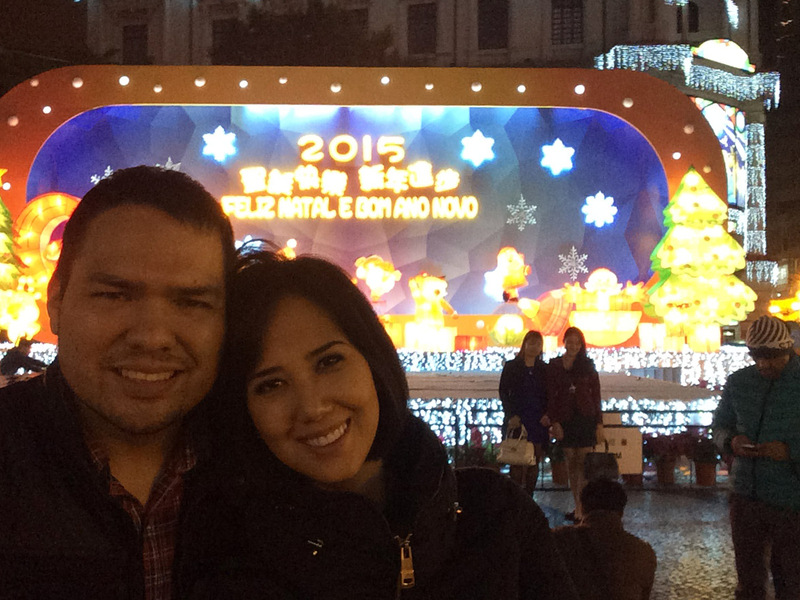 Fotos we took in Senado Square the night before. 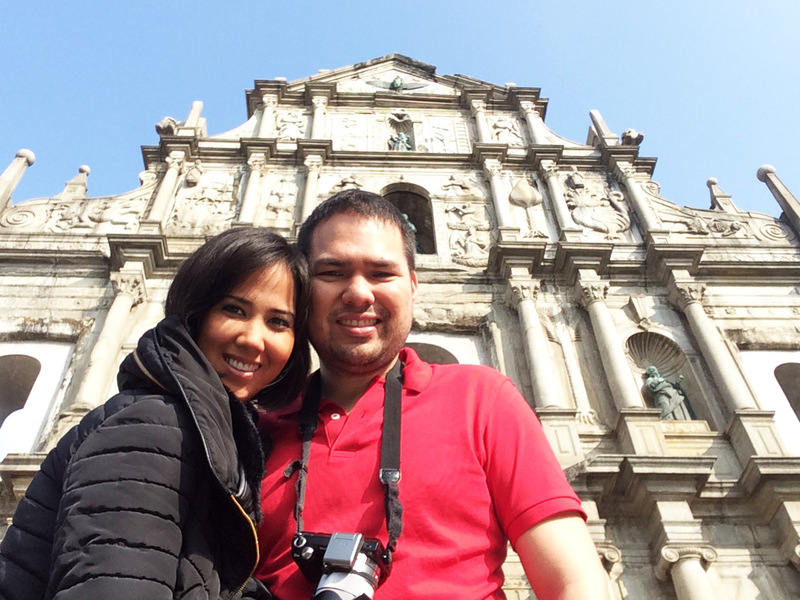 Walking down Senado Square, you will find Saint Dominic’s church. 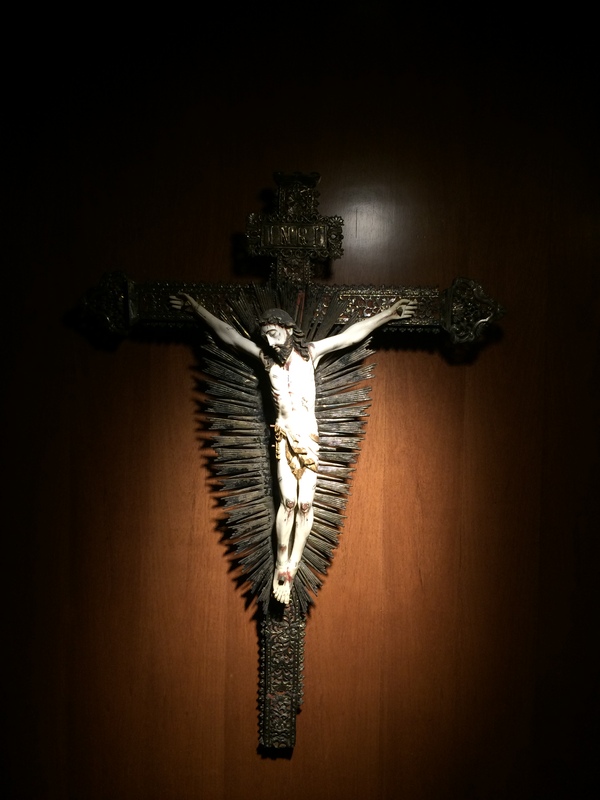 The church was constructed by the Spanish Dominican friars who worshiped St. Domingo and Lady Fatima (a Portuguese goddess) in the mid 17th century. What. A. Struggle. to take this shot. First constructed in 1580, St. Paul’s Church caught fires in 1595 and 1601. However, reconstruction started in 1602 soon after the church was burnt down. 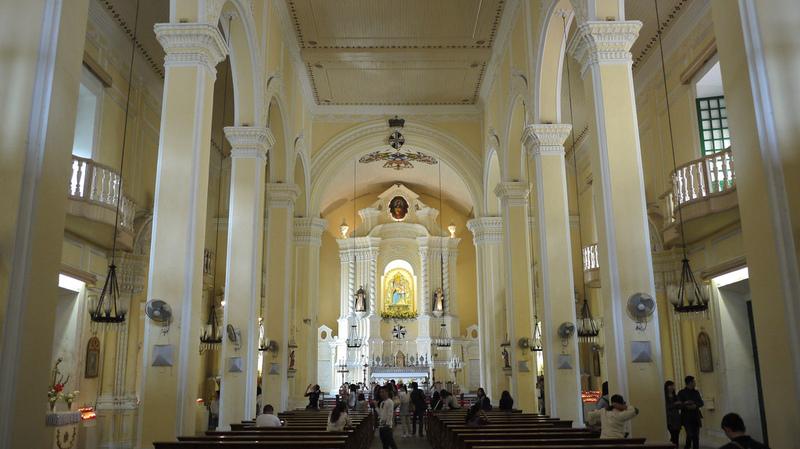 Completed in 1637, the church became the biggest Catholic Church in East Asia at that time. 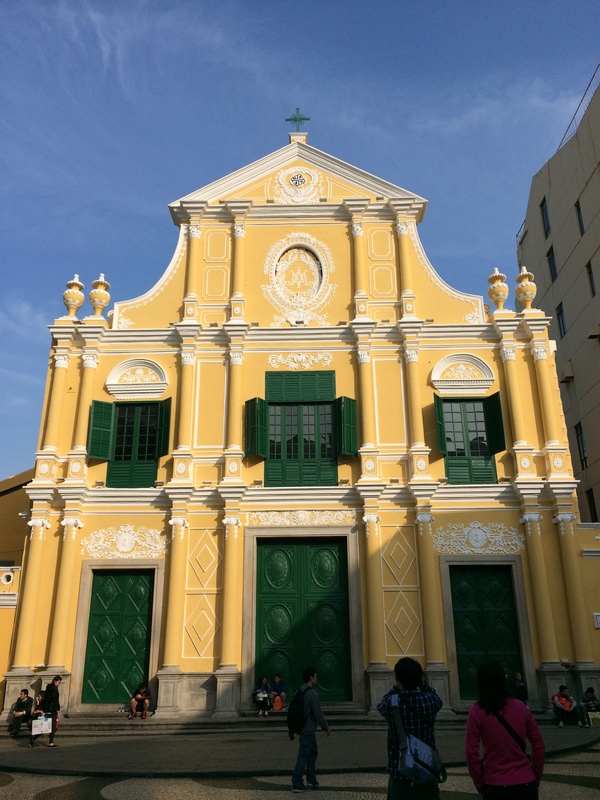 Unfortunately, a violent typhoon hit Macau in 1835 and the church caught fire for the third time leaving its glory a history. The Museum of Sacred Art and Crypt were built in the inner area of the Ruins of St. Paul’s where the magnificent church of Mater Dei had been previously located. Entrance is free, they are open from 9 am – 6 pm, and they close at 2 pm on Tuesdays. 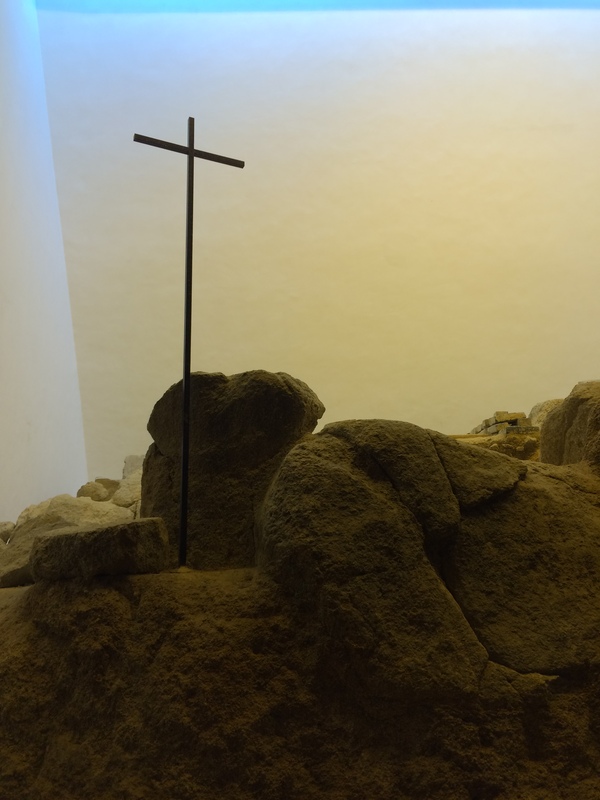 In the centre of the Crypt, on the granite rock, lie the remains of a tomb, which might have belonged to the founder of the St. Paul’s College, Father Alexander Valignano. 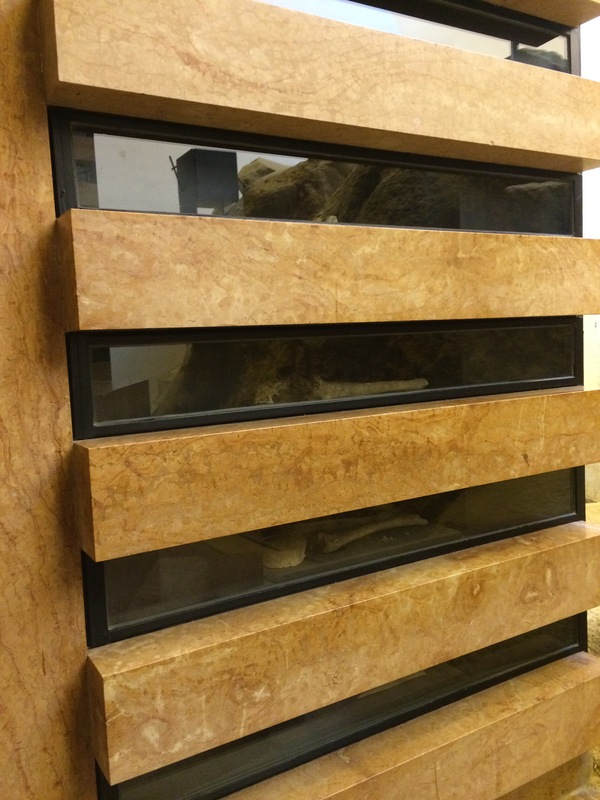 Along the sidewalls, there are relics of Japanese and Vietnamese martyrs. 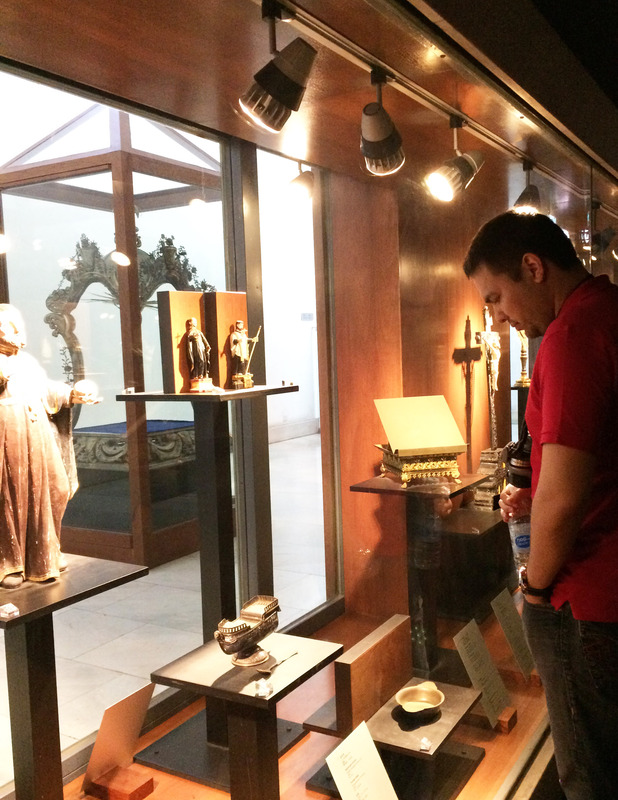 In the room adjacent to the Crypt there is a Museum of Sacred Art, which includes objects of high historical and artistic value from different churches and convents of Macau. 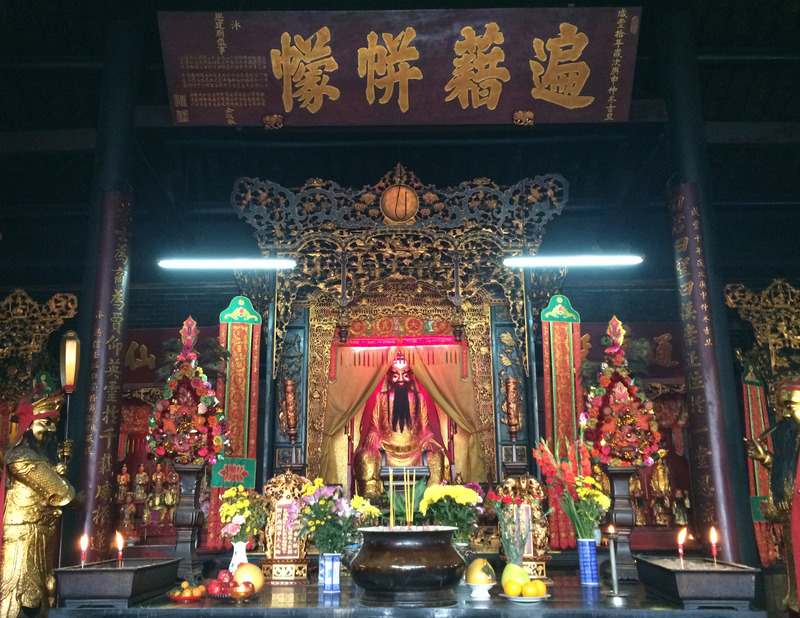 We did a slight detour and walked towards the Hong Kung Temple, a 200-year-old temple dedicated to Li Lie, a Han-dynasty general. Google maps said that it is a 7 minute walk from the ruins. 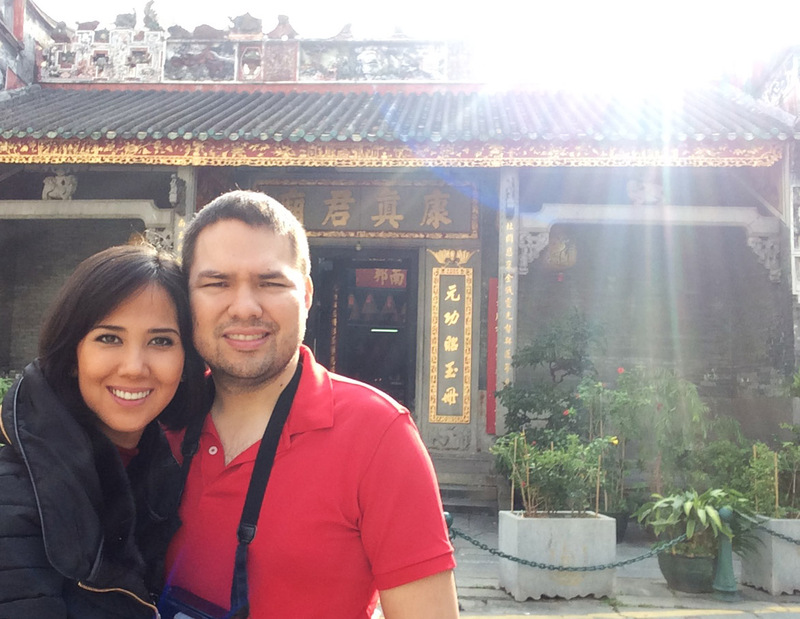 but it took us about 15 minutes to lug ourselves to the temple. 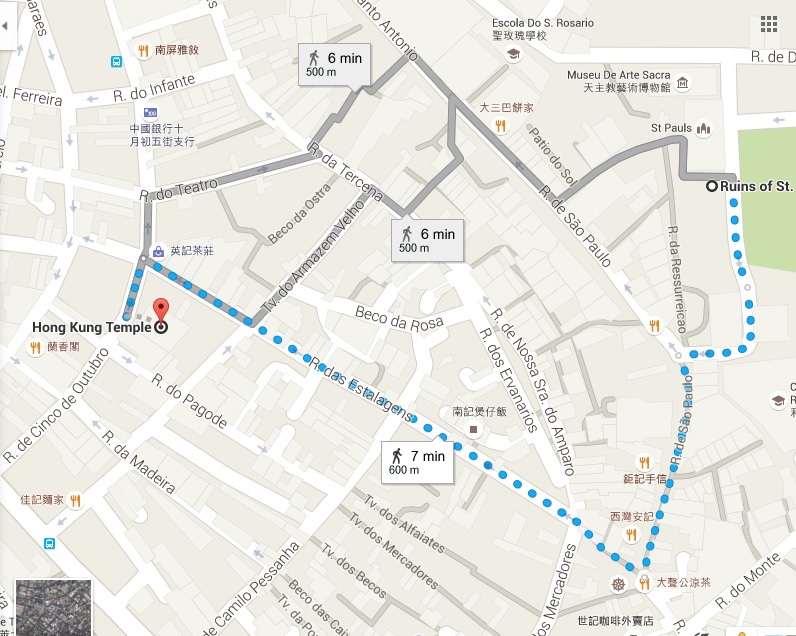 After the temple, we walked back to Senado Square to wait in line for a table at the Wong Chi Kei restaurant. 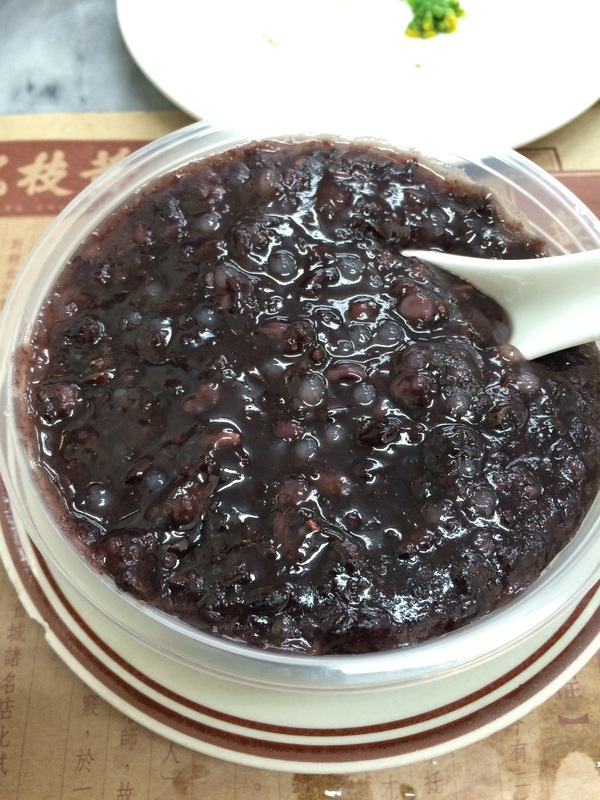 It is a noodle and congee house which has a long history every since it opened in 1946. 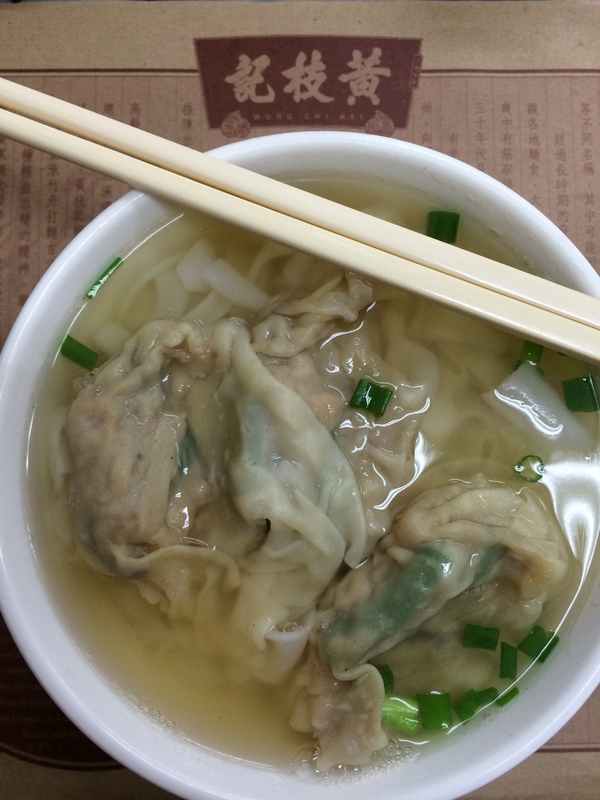 It is one of the most popular noodle shops in Macau and the line is always long. It is located at 17 Senado Square and open from 8 am until midnight. What we gobbled down. 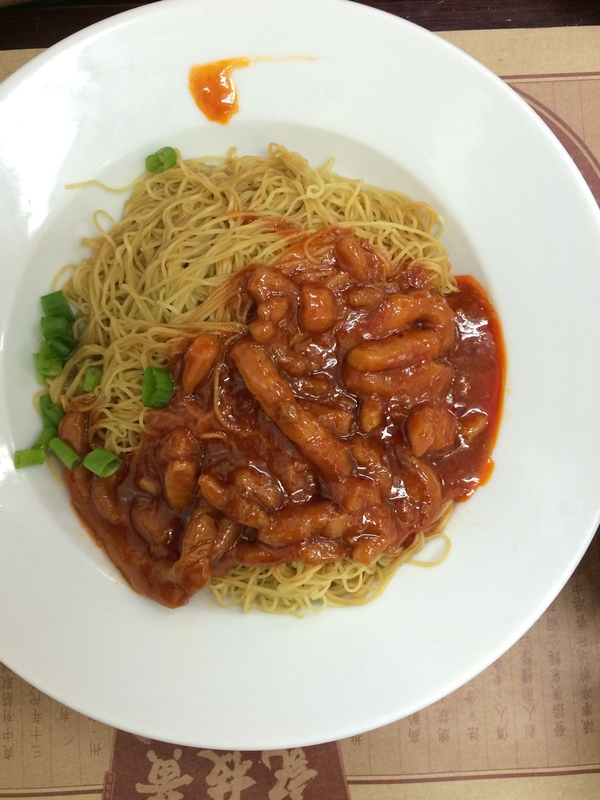 Marco ordered something with the canton noodles (on the right), which is their specialty. 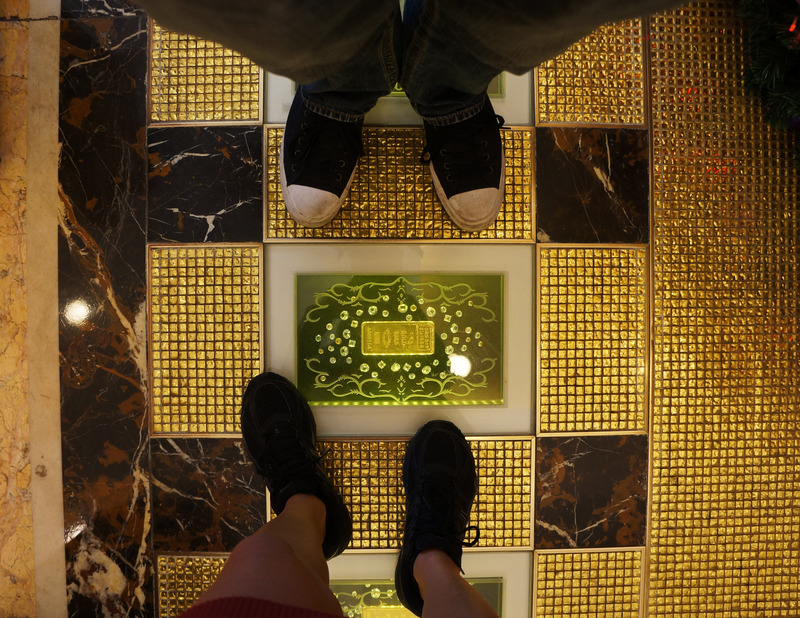 After lunch, we walked to The Grand Emperor Hotel to check out the gold bars. 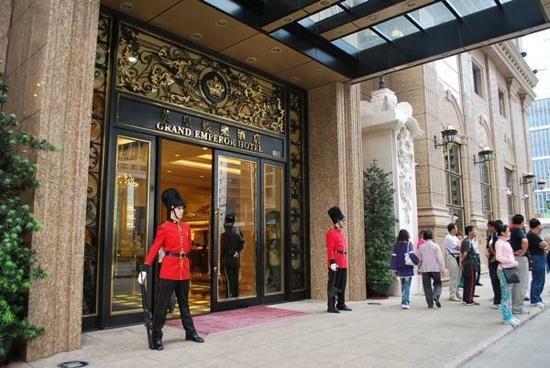 In November 21, 2005, 88 pieces of gold bars were delivered for The Grand Emperor Hotel from HSBC Guyerzeller AG bank. 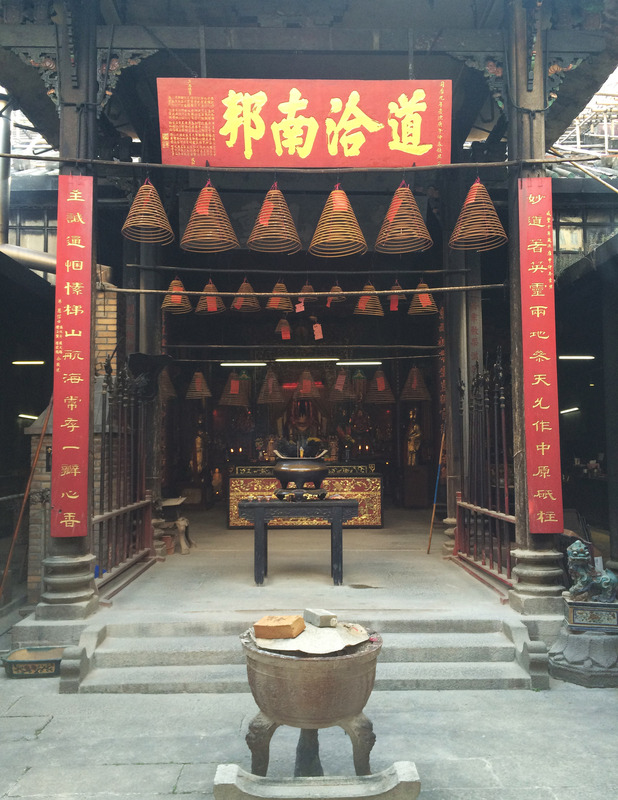 Our next stop was the New Yaohan to wait for the open top bus for our hop on hop off tour. We boarded the bus at 1:32 pm and just stayed on the bus to see the sights. We paid 200 hk per person online at http://www.goldspark.com.hk. Their open top bus tour starts at 9:30 am and departs every 45 minutes, and they have free wifi on board. 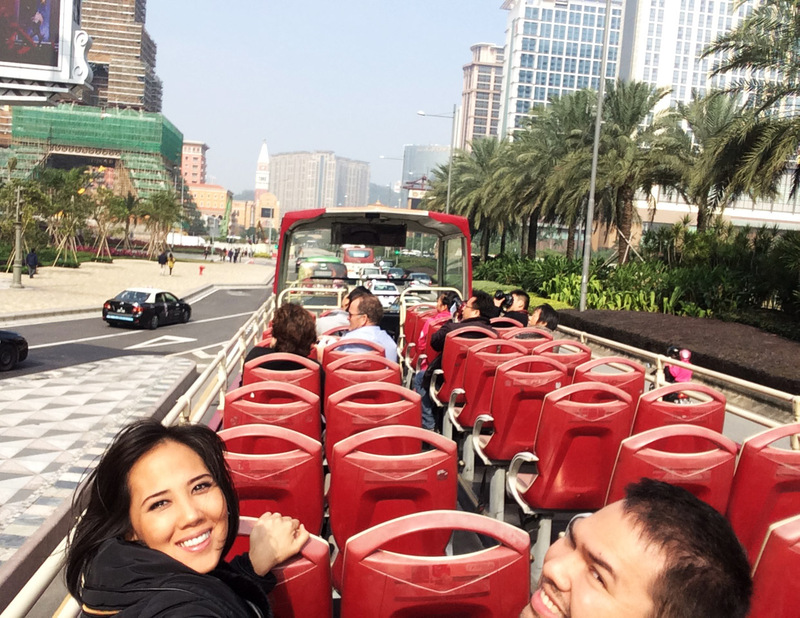 Wubys on the Macau hop on hop off bus tour, Cotai Strip. It was nice to be on the open bus tour, instead of doing everything on foot. 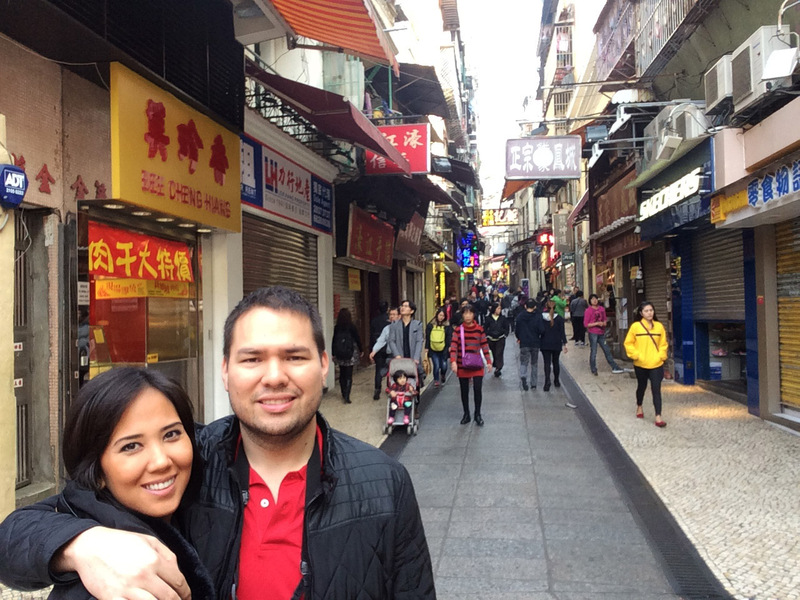 We got to see more sights of Macau without having to move our layzeyyy butts. NOW I understand why these tour buses where always full! After an hour of being on the bus, we finally reached the Galaxy Hotel, our stop. This hotel is huge! And we walked it’s whole length. Wubys in the Galaxy Hotel. 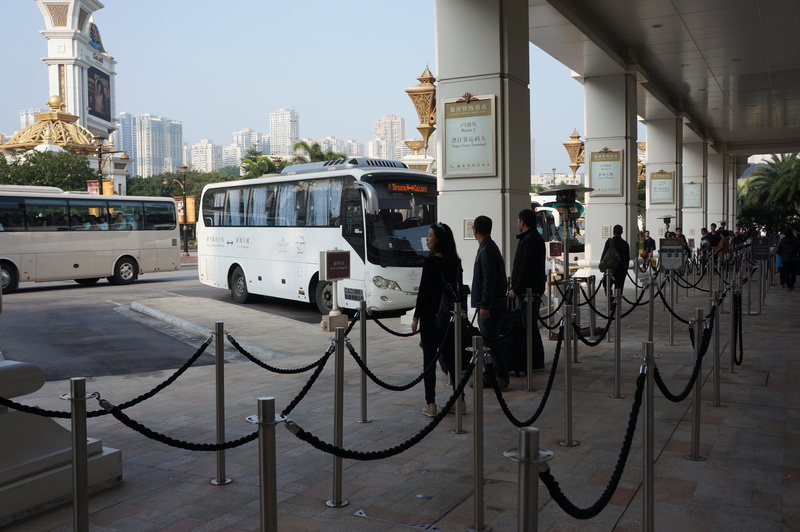 The big hotels in Macau all have free bus services. 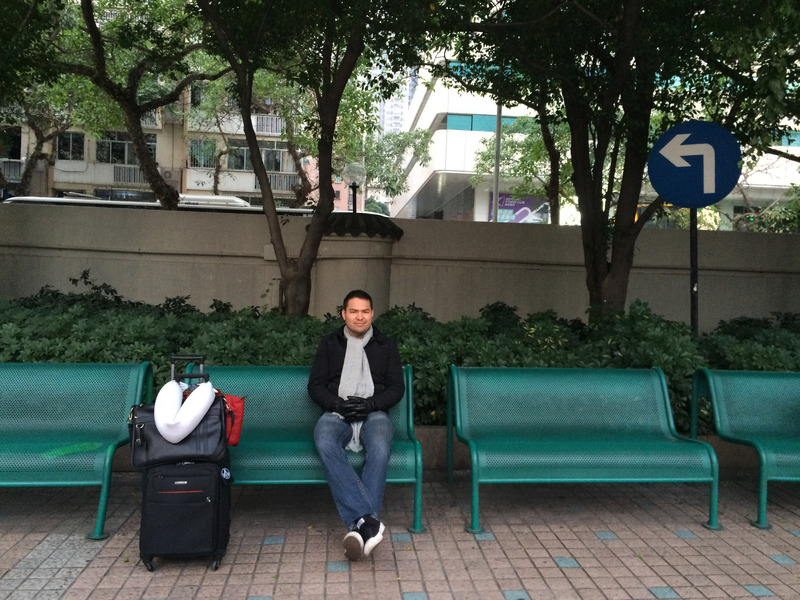 Outside the Galaxy, we took the bus headed to Taipa Ferry Terminal, where we were going to ride the ferry that would take us to Hong Kong. There’s my Wuby waiting in line while I take fotos. KY, this is so timely. 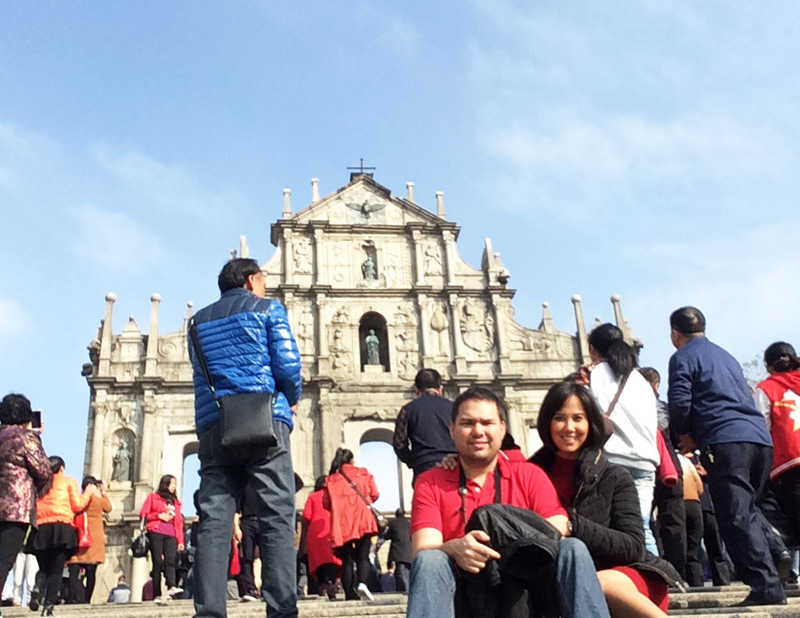 I’ ve been to Macau twice, the last one with my balikbayan sister , last June. Since we came from HK and we had to catch the ferry back to HK, we didn’t see much of it except the Senado area and the Venetian. On Thurs,( Jan 28) Lito and I are going there ( it is his bday) till Sat night. 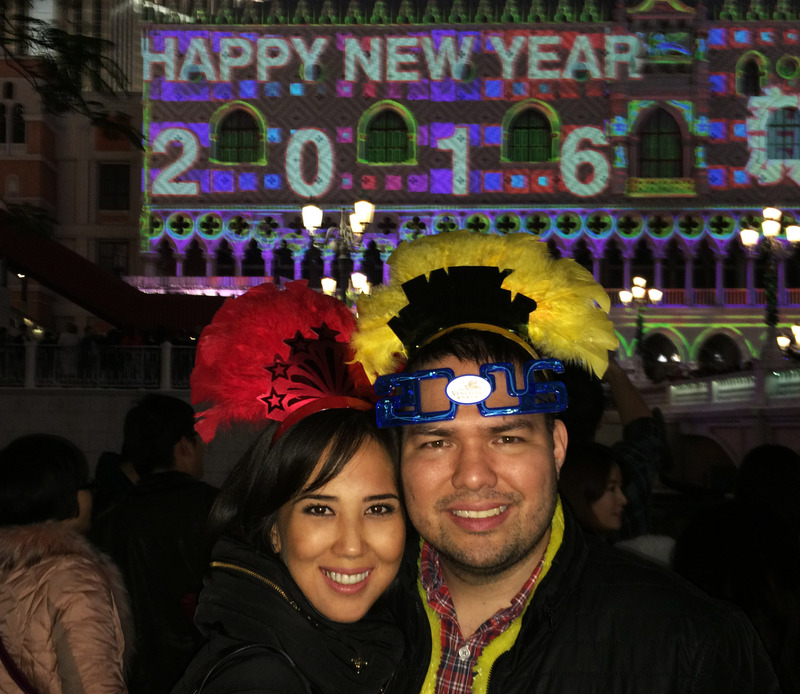 I will use your blog to help us navigate our way to the diff sites in Macau.